← Stand Up For the Forest — Children’s Forest Music Video! This entry was posted in Videos and tagged Music, Theatre, Video, Youth. Bookmark the permalink. 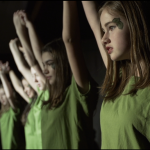 One Response to Video: Children’s Forest Youth at the CRTZ Winter Lip Sync!